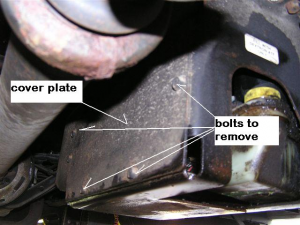 Home › FAQ › A blown AutoPark parking brake fuse just about always guarantees a parking brake lockup. A blown AutoPark parking brake fuse just about always guarantees a parking brake lockup. A blown AutoPark fuse just about always guarantees a parking brake lockup. You HAVE to have 12 volts to the AutoPark parking brake system control circuit so the Rotten Green Switch (aka RGS aka pump motor switch) can energize the pump motor relay. If the relay cannot be switched, the pump cannot run – – and the pump MUST run to release the parking brake. You must also have 12 volts in the same circuit to hold the solenoid valve closed while you are going down the road. If the solenoid is open, the system cannot build pressure and again, the brake will be applied. The above picture is of the interior of the earlier versions which have the pump in the same box with the actuator. Later versions have the pump located at the front of the coach under the utility hood. The Light Switch however, is always under the coach and fastened to the actuator as shown above. Very often (maybe 80 percent of the time), the switch when failing, may start leaking the pressurized ATF, and quits functioning as a switch. But, in the other 20 percent of the cases, the switch may develop an internal short to ground – – thus blowing the AutoPark circuit fuse. When this happens, the parking brake is immediately applied – – fast lane or your driveway – – wherever. There are various other things that can cause a lockup like this, but the first thing to do is to check the AutoPark lite on the dashboard. If the fuse is blown, there will be NO illumination of the AutoPark lite – – NONE. This translates into NO voltage for the RGS and the relay, OR for the solenoid. When should the AutoPark parking brake light be illuminated? It should be on (assuming the ignition switch is on) whenever the shift lever is in PARK. Additionally, it should be ON for about 5 seconds when you pull the shift lever out of PARK. For that same 5 seconds, you should hear the AutoPark pump running. The pump AND the AutoPark lite should both run together, and shut off together at the end of the 5 (or so) seconds. On most Chev/Workhorse chassis, the fuse panel which holds the AutoPark fuse, will be located to the left of the steering column, under the dash and near your left knee. We can make no promises as to how the fuse will be labeled. 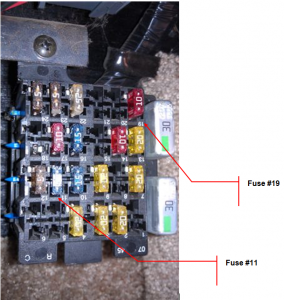 Often, it will be fuse #19, #11, or a fuse marked AA – – as in auto-apply. Given its importance, it would be best if this fuse was on its own isolated circuit, but lots of times the house builders will hang additional loads on whichever fuse looks convenient. 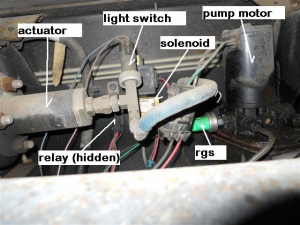 If your AutoPark parking brake system is sharing its fuse with other circuits, then these other circuits may need to be identified as they could be the source of a short circuit. If you are having a difficult time locating a short, especially the intermittent ones, let us know and we’ll share some pointers on locating them. We’d like to emphasize that any time you have a blown fuse for the AutoPark circuit, it is REALLY important to discover WHY the fuse blew. Until you find the source of this problem, you are taking a big gamble when you drive your coach. Lockups caused by a blown AutoPark fuse are INSTANTANEOUS.